We make one single color to match every door - a perfect combination of black and silver accents. Does Ultraloq U-Bolt Pro auto relock? Yes, it has an Auto-Lock feature, which you can set up through the app. You can turn this feature off through the lock or in the app. It also has a Lockout mode that all the electronic access features are disabled for the highest security level (when traveling). Can I open my door if I don’t have internet access? Yes, you can use your fingerprint, code, your smartphone via Bluetooth or key to unlock. How does Auto Unlock work? The Auto Unlock is a feature where Ultraloq U-Bolt Pro will unlock your door automatically as you approach. Once App knows you're returning to your door via smartphone GPS, it will send the Unlock command to your Ultraloq U-Bolt Pro via Bluetooth. Can I still open my door if the batteries die? Yes, you can just use the backup mechanical key or connect a power bank to the external micro-USB outlet to activate the lock from outside. What are the max users we can program to this lock? Total of 60 users. Each user can register 2 fingerprints, 1 code, and 1 smartphone to unlock. Does Ultraloq U-Bolt support Alexa, Google Assistant or IFTTT? Yes, it does support Alexa, Google Assistant, and IFTTT. You will need to have Ultraloq Bridge for this feature. Does Ultraloq U-Bolt Pro support Smart Home Hub like SmartThings? We are working on the integration with all major smart home platforms. SmartThing is in our Stretch Goal. You need to have Ultraloq Bridge. Is firmware of Ultraloq U-Bolt Pro upgradable? Yes, firmware can be upgraded via App for new improvements and features from time to time for free. Ultraloq U-Bolt Pro is powered by 4 X Alkaline AA batteries for up to 8,000 times access. That is to say; battery life is up to 1 year on an average use of 20 times access per day. You will also get low battery alert via beeps; red LED flashing and notifications in the app when your Ultraloq can still be unlocked for hundreds of times so you will have more than enough time to replace the batteries. "2.95 x 2.95 x 1.22 inch / 75 x 75 x 31 mm (front panel) 2.95 x 4.92 x 1.39 inch / 75 x 125 x 35.3 mm (back panel)"
What voltage and frequency does Ultraloq Bridge support? Can I get the same plug as in my country? Ultraloq Bridge supports 100-240 VAC and 50/60 Hz. At this moment, only the US style is available. A power adapter may be required if you are outside of the US. How does it integrate with other connected devices? The exterior part of the lock is waterproof. Yes, it does. Ultraloq U-Bolt Pro works with iPhone (iOs 9.0 or higher) and Android (5.0 or higher) smartphone. Can I unlock or check the log when away from my house via app, or do I need to be within Bluetooth range? You can use Bluetooth to connect when you are near Ultraloq U-bolt Pro. You need Ultraloq Bridge to access, unlock, and create settings remotely. Can I register a fingerprint for my guest for temporary access? Yes, you can register a finger, code or ekey for temporary users for scheduled access as well as set up the times the person can access the door. e.g. January 1 to 30- from 9:00-17:00 every Monday to Friday. Can I set U-Bolt Pro to lock and unlock at certain timings every day like Unlock at 9:00 and Lock at 17:00? Yes, that can be done with IFTTT. Ultraloq Bridge is required. Do I need to pay for monthly fee for sharing eKey and other features in App? How many Ultraloq U-Bolt Pro can one Ultraloq Bridge support? One Ultraloq Bridge is needed for each Ultraloq for best performance and stability. How many Ultraloq U-Bolt Pro does the U-tec App support? There is no limit! As many as you'd like. 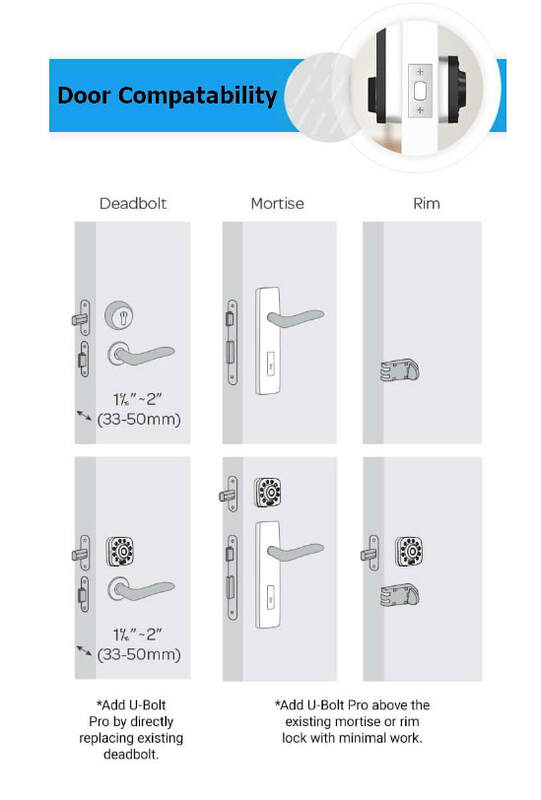 Can standard deadbolts be replaced with this device? Yes. All you will use is a screwdriver. How can I install Ultraloq U-Bolt Pro to replace my existing mortise? You can't replace a mortise with U-Bolt Pro. However, you can just drill a hole with the help of template in the box, install it on the top of it and leave your mortise unlocked. Can Ultraloq U-Bolt Pro be installed on a right handed or a left handed door? Yes, you can install it on either one. What are the thickness ranges that Ultraloq U-Bolt Pro can support? Ultraloq U-Bolt Pro can be installed on any door with a thickness between 1.3 ~ 1.96 inches (33 ~ 50 mm). If your door is thicker, please contact us.